Last week, temperatures in New York City peaked in the mid 90s but with the humidity index, afternoon to early evening temperatures felt more like 105 to 113 degrees. The combined temperature and humidity index prompted an “excessive heat warning” for the city and sent most residents indoors to take refuge in air conditioned homes and workplaces. For those less fortunate, the city opened designated cooling centers. Under such dire conditions, it’s natural to wonder, what was summer like before the invention of air conditioning? 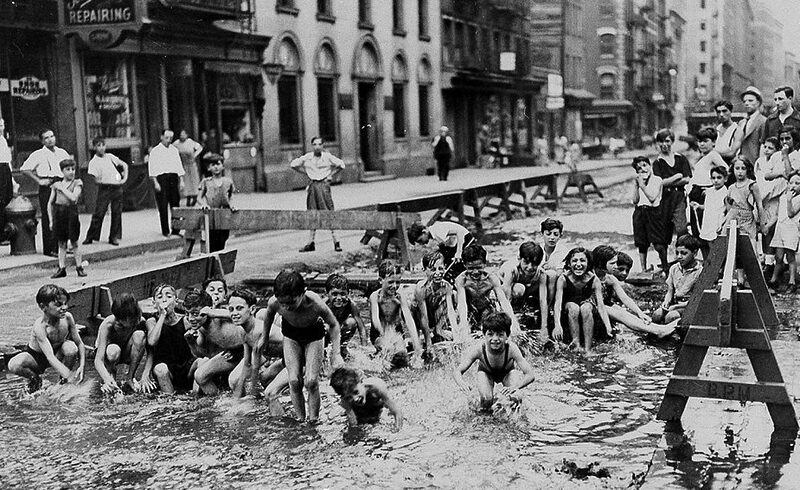 As anyone who has lived through a New York City heatwave might imagine, life in the city prior to the widespread availability of air conditioning ranged from highly uncomfortable to deadly. 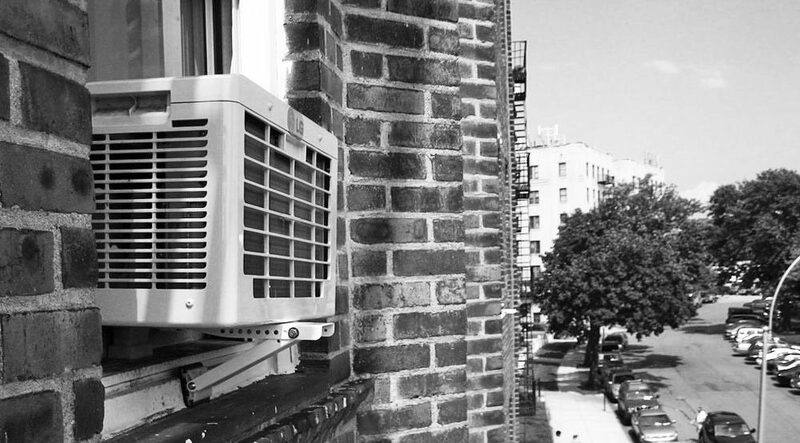 Until air conditioning became widely accessible in the 1960s, summers were often marked by high death tolls as people crammed into tenements in high-density neighborhoods, like the Lower East Side, succumbed to the heat. On July 4, 1872, the New York Times reported that 100 city residents had died from heat exposure in the previous 48 hours, but the article also noted that in many cities, such as Calcutta where temperatures often soar above 90, residents still manage to cope. The article suggested that the high death toll may be more directly linked to New Yorkers’ love of “spirituous drinks,” which also tend to be consumed in much higher quantities during heatwaves. New York’s stifling tenements and poor heat coping strategies were not the only problem during early heatwaves. To this day, New Yorkers still complain about the sweltering conditions on MTA subway platforms (last week, reported temperatures were well above 100 degrees in many stations), but in the early 20th century, commuters were even worse off. When a subway rolled into the station on a hot day, it brought no relief. Indeed, commuters had no choice but to cram onto crowded and sweltering subway cars and not always without consequence. During the city’s deadly 1911 heatwave, the rush hour subway situation was described by one reporter as follows: “As each train crept into a station prostrated passengers were assisted to the benches. At the Grand Central Station Dr. Baer of Flower Hospital attended many of the sufferers. Many others were rushed to the drug stores in the vicinity.” Four years later, during another heatwave, a 45-year-old subway worker was reportedly so “crazed by the heat after a day of hard work” that he and committed suicide. Despite the perils faced by city residents prior to the invention of air conditioning, resourceful New Yorkers’ have always found ways to cope with the summer heat. Art and Picture Collection, The New York Public Library. 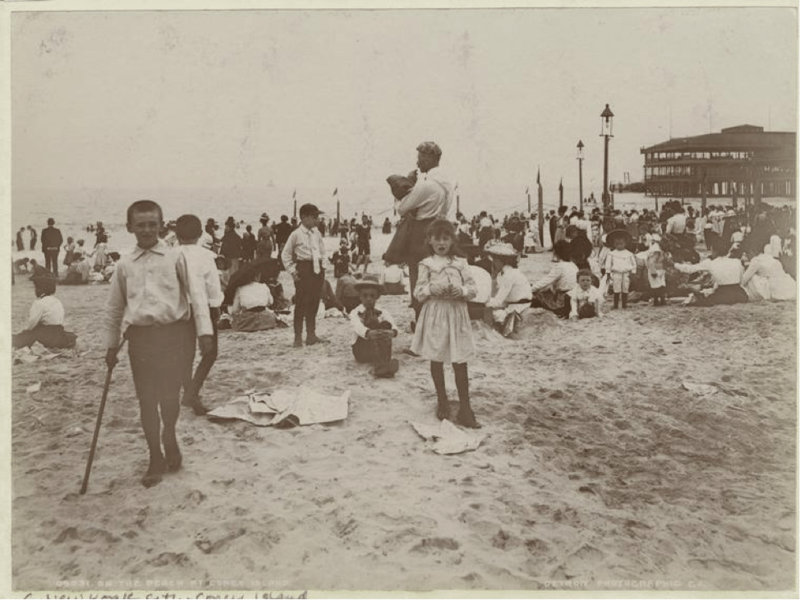 “On the beach at Coney Island” The New York Public Library Digital Collections. 1901 – 1905. Although both the East and the Hudson rivers were highly polluted bodies of water by the late 19th century due to the presence of industrial and human waste of all kinds, until the mid 20th century, swimming in both bodies of water remained a popular way for New Yorkers to cool off. Swimming, however, also came with its risks. Drowning deaths often spiked during local heatwaves. Fortunately, for the more cautious, there were also a number of floating baths located along the shores of the Hudson and East River. Popular from the early 19th century onwards, these baths or pools offered a controlled swimming environment on the city’s local waterways (the floating baths were enclosed and usually only 2.5 to 4.5 feet deep). The first free public floating baths appeared in the East River in 1870 and by the 1890s, the city had 15 baths in operation on both the west and east shores of Manhattan. The baths, eventually taken over by New York City Parks, were finally closed to the public in the early 1940s due to deteriorating water conditions or more likely, a growing recognition of the risks associated with swimming in such water. Irma and Paul Milstein Division of United States History, Local History and Genealogy, The New York Public Library. 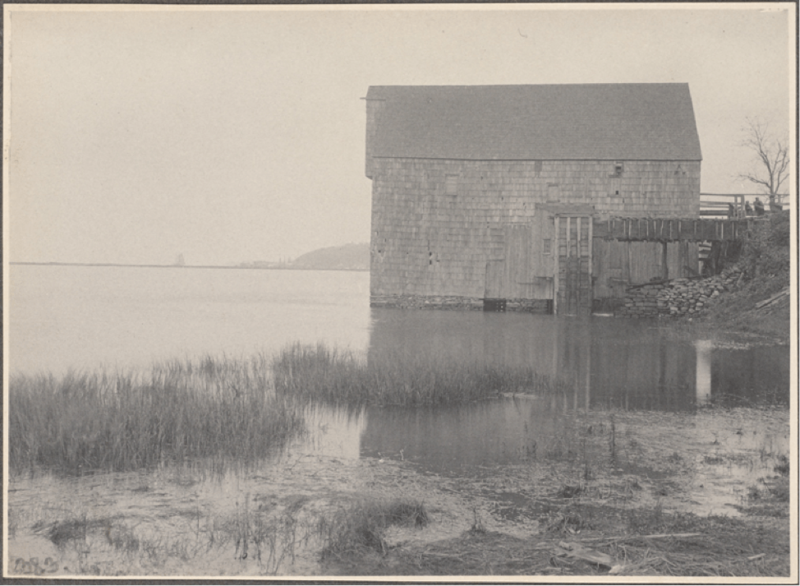 “Ice house in Cold Spring Harbor, L.I.” The New York Public Library Digital Collections. 1885 – 1914. But perhaps the best way to beat the summer heat in the city prior to the invention of air conditioning was to acquire a job working in a local ice house. Although a grueling job by all accounts, ice houses were no doubt the coolest work environments in the region prior to the arrival of air-conditioned workplaces.